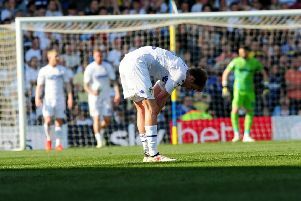 Neil Warnock came back to haunt Leeds United as their winning home run came to an end with a 2-0 defeat to Cardiff City. The Whites lost for the fourth weekend on the trot and appeared to lack confidence against a typical Warnock managed team full of combativeness and ready to break play up at every opportunity. Leeds’ frustration showed as they ended with 10-men with captain Liam Bridcutt sent-off for a second bookable offence by pedantic referee James Linington who moments earlier had denied the Whites a good shout for a penalty. With Warnock not that long since in the manager’s hot seat at Elland Road the kind of game it became should have surprised no-one, but United fell into the trap of playing too slowly at times and conceding too many free-kicks and throw-ins that allowed Cardiff to launch the ball into the box. The visitors carried little threat in the first 45 minutes, though, a Joe Ralls header from a free-kick directed straight at home keeper Rob Green being their only effort of note. But Leeds struggled to create much as new signing Alfonso Pedraza had a couple of efforts blocked and Pablo Hernandez sent two efforts wide from the edge of the box. Cardiff keeper Alan McGregor’s one save in the first half was an easy one to collect a Chris Wood free-kick. The frustrations began to grow with the decisions of referee James Linington, particularly when he awarded a foul throw against Leeds from no more than a yard ahead of where it should have been taken. Skipper Bridcutt spoke out of turn and after earlier being in the ear of the whistle blower obviously made one too many complaints to the official as he was yellow carded - something that was to prove costly later. The second half started with the Whites showing more urgency and it took a great clearance by Sol Bamba to deny Chris Wood as he aimed to get on the end of a dangerous cross. Liam Cooper then headed over from a Hernandez corner, but on 53 minutes Cardiff were ahead as Sean Morrison met Craig Noone’s free-kick and headed the ball into the back of the net. Noone came close to adding a second three minutes later as his snap shot was saved by Green. Kenneth Zohore then saw a header cleared off the line by Bartley as United switched off defensively again and appeared to be missing the commanding presence of ill centre-back Pontus Jansson. Leeds did create a decent chance on 66 minutes when substitute Hadi Sacko got in behind the Cardiff defence to deliver a low cross to Wood, but the ball was just slightly behind the striker and although he got a shot away he could not guide it on target. It was 2-0 to the visitors soon after when a succession of defensive errors allowed Aron Gunnarsson in behind the home defence and with Green rushing off his line he slipped the ball to Zohore who had an easy task to tap into the unguarded net. United did keep going, however, as Kyle Bartley headed over and second sub Kemar Roofe could only produce a weak shot straight at the keeper when well placed in the area. Cooper sent a header on to the top of the net from a Hernandez corner while Kadeem Harris shot over from the edge of the box at the other end. Luke Ayling saw a big shout for a penalty turned down after he appeared to be brought down in the box and seconds later to the hosts’ double frustration Bridcutt was shown a second yellow card for a foul and was sent-off by a referee who had let early more robust challenges by Cardiff players go unpunished by card. Still United kept plugging away, although without any great belief in the final third and it summed up their day in injury-time when Roofe was put through by a great Hernandez pass only to again shoot weakly straight at McGregor. Leeds boss Garry Monk admitted to being frustrated. He said: “It’s something new for the group. I think it’s the first time we faced a team that came to frustrate. “We had to try to be patient and move them around. We tried that in the first half without that killer edge. “I said at half-time we had to stay with the patience. I thought we started the second half well and upped our tempo, but the key is against teams like this you can’t mistakes. “Unfortunately we made those mistakes for the two goals. “Overall I thought they dealt with the situation quite well and we were probing. We had to try and move their shape and we knew it might take time and they would tire. But we made two mistakes and were behind at that stage and did not put us in a position to win the game. “I wasn’t too disappointed with the performance. The key was try to make them run and opportunities would come. They probably did, even with 10 men we had our best chance with Kemar. Leeds: Green, Ayling, Bartley, Cooper, Berardi, Bridcutt (sent-off 86), Vieira (Doukara 76), Dallas (Sacko 62), Hernandez, Pedraza (Roofe 71), Wood. Cardiff: McGregor, Connolly, Morrison, Bamba, Richards, Halford, Noone, Ralls, Gunnarsson, Harris (Hoilett 87), Zohore (Lambert 87).